Earlier this month, CMS released the Medicare Physician Fee Schedule (MPFS) final rule for calendar year 2019. For imaging, many of the biggest updates concern the imaging clinical decision support (CDS) mandate, also known as the Medicare Appropriate Use Criteria (AUC) Program. Notably, the agency upheld the January 1, 2020 start date, clarified provider consultation requirements and outlined plans for documentation. Read on for six major takeaways—and, importantly, our guidance on how to respond. The following article originally appeared on the Advisory Board website and has been republished here with permission from the author. The original publication, co-authored by Erin Lane and Catherine Kosse, can be found here. If you'd like more information about Clinical Decision Support, be sure to register for our April 18 webinar, featuring more of Erin's expert insights. 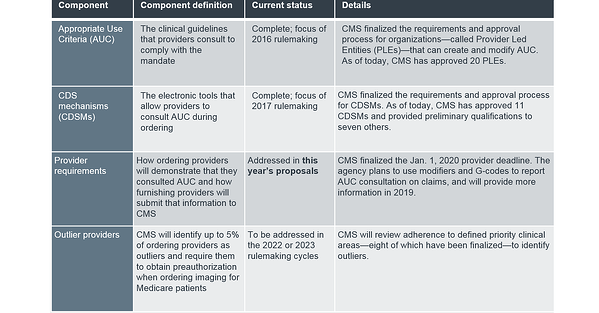 In this year's final rule, CMS reinforced the January 1, 2020 program start date, which was previously finalized. This means that, in 2020, providers must consult AUC when ordering outpatient advanced imaging (CT, MRI, PET, nuclear medicine), and furnishing providers (radiologists and imaging programs) must document this consultation on both professional and technical claims for Medicare fee-for-service beneficiaries. The mandatory first year is deemed an "educational and testing" period, meaning claims will be paid regardless of documentation. Beginning January 1, 2021, Medicare will deny claims that do not include necessary information (more on documentation below). In the meantime, providers may use the modifier QQ during the voluntary reporting period already underway. Ordering providers who attest to CDS consultation may earn credit under QPP's Merit Based Incentive Payments System (MIPS). Read more about how the AUC Program aligns with QPP in our 2018 analysis. Guidance for providers: Although claims will not be denied until 2021, CDS consultation is mandatory in just over one year. Organizations should develop an implementation strategy now to allow time to test the product, educate and train ordering providers, and slowly roll out the tool across the health system. Encourage ordering providers to participate in voluntary reporting, and emphasize the potential to earn MIPS credit as a benefit to early adoption. Use our tools and resources designed to help imaging leaders throughout the implementation process. National provider identification (NPI) number of the ordering professional. CMS plans to use G-codes for CDSM consultation and modifiers for AUC adherence. Next year, the agency will release more guidance, as well as the specific codes to use, so that organizations are prepared for the mandatory 2020 start date. Guidance for providers: Radiologists and imaging programs are financially responsible for documenting CDS consultation. Even though we don't know exactly what that process will look like, imaging leaders should start working with their informatics team and CDS vendors to prepare for reporting. For more information on how to ensure CDS adherence, review section three of our toolkit. We now have an answer to perhaps the most asked question: Who can consult CDS? Clinical staff: An individual working under the direction of the ordering provider. This staff member must have sufficient clinical knowledge to consult CDS and communicate results back to the ordering professional. CMS will allow clinical staff to consult CDS on behalf of ordering providers to ease reporting requirements. Importantly, this only applies to staff within the ordering provider's office and does not include radiology staff or radiologists. Keep in mind that the ordering professional's NPI will be recorded on the imaging claim, even if a clinical staff member consulted CDS. The ordering professional is responsible for correct consultation; the NPI will be used to identify outlier ordering providers subject to Medicare prior authorization, which will begin as early as 2023. Guidance for providers: Now that more individuals are able to consult CDS, imaging leaders must expand education efforts to this new cohort. Review section one of our toolkit for resources to guide your education strategy. Guidance for providers: Including IDTFs in the definition of applicable settings equalizes the playing field for imaging providers. Ordering providers must consult CDS for all outpatient facility types. To differentiate yourself in the market, radiology programs should identify ways to streamline CDS consultation and documentation. These are in addition to two previously finalized exemptions: inpatient services and suspected emergency medical conditions. To claim an exemption, providers will report modifiers, which CMS will create at a later date. Guidance for providers: Imaging leaders should educate ordering providers on all CDS requirements and exemptions. Ultimately, imaging's reimbursement is at-risk if the ordering provider cannot consult CDS and doesn't claim an exemption. Up to 5% of ordering providers will be identified as outliers and required to obtain preauthorization when ordering imaging for Medicare patients. In this year's rule, CMS requested public feedback on creating the methodology for outlier identification, particularly around the required data elements and thresholds. CMS will address this further in the 2022 or 2023 rulemaking cycles. We do know that adherence to AUC within eight priority clinical areas will be considered. For more information on the finalized priority clinical areas, read our 2017 analysis. 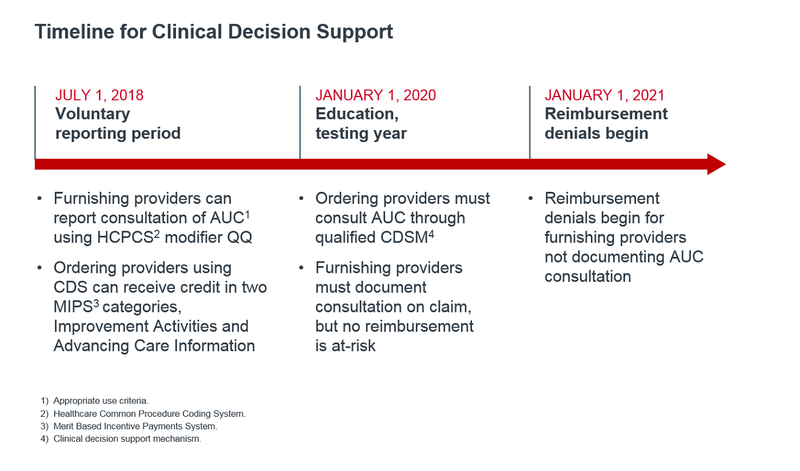 Guidance for providers: While imaging's reimbursement is at-risk, the outlier classification and required preauthorization is one mechanism to hold ordering providers accountable for appropriate CDS consultation. Stress the potential for Medicare prior authorization when providing CDS education to these professionals. For more information on talking points, refer to section one of our toolkit. In the Protecting Access to Medicare Act (PAMA) of 2014, Congress included a mandate for ordering providers to consult AUC via electronic CDS when ordering outpatient advanced imaging exams for Medicare patients. Furnishing providers—most commonly radiologists and imaging programs—must document that consultation for reimbursement. Ready to learn more? Join us on April 18 as Erin provides more information in an interactive webinar! Erin Lane is a research consultant with Advisory Board's Imaging Performance Partnership, which provides best practice research and strategic guidance to imaging leaders and radiologists. Erin's primary areas of focus include policy analysis, care delivery transformation, and outpatient growth. She has also authored and presented work on interventional radiology, patient experience, and financial sustainability for imaging service line leaders and radiology group executives. Prior to joining Advisory Board, Erin worked in research at the University of Richmond's Biology Department. Her research focused on the prevalence of the bacterium resulting in Lyme disease, integrating field and lab data to examine the public health risk of tick-transmitted diseases. Catherine Kosse is a Senior Analyst at the Advisory Board.